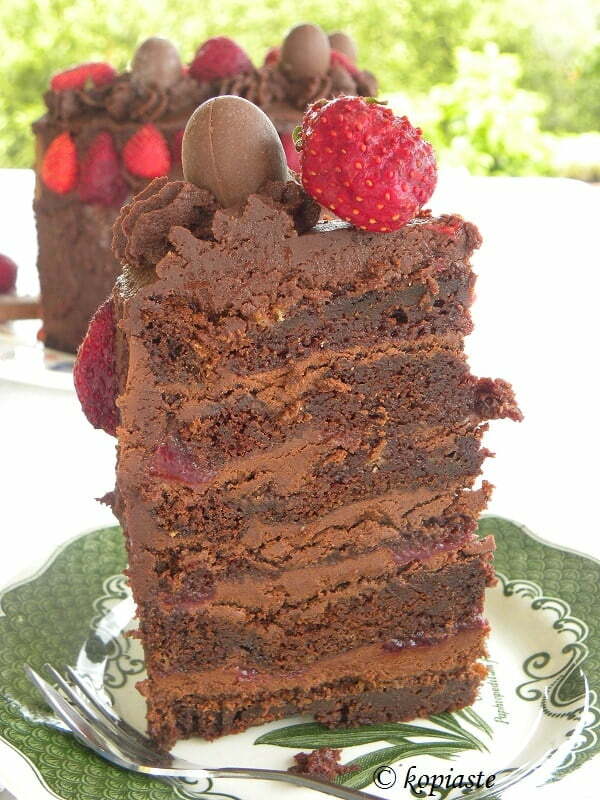 An impressive strawberry chocolate coffee celebration cake for any occasion. It is made with a simple and easy to make sponge, filled with Chocolate Mousse and Strawberry Sauce, topped with fluffy chocolate buttercream frosting and decorated with fresh strawberries. The cake was made with Greek extra virgin mild olive oil, Greek Yoghourt and Greek Coffee. If your olive oil is not mild you can mix it with some vegetable oil. This cake was first made for my birthday on 29th March, 2016. However, on the same day I had a cooking class and I was too busy to copy the notes I took on a piece of paper. The paper got lost and did not remember the exact ingredients used. I waited to make it again for my son’s birthday which was on the 29th April so that I could take notes again. However, the two cakes have some minor differences. The sponge is the same in both recipes. It was adapted from two older recipes, a Vegan Chocolate Cake and this Chocolate Cake. It is very easy and foolproof to make. The cake is fluffy, moist and delicious with a delicate coffee flavour. As I wanted the second cake to have more coffee taste, I substituted vanilla with coffee essence. The filling of the first one was made with white chocolate and vanilla. I used half of the white chocolate to make the leaves and the remaining melted chocolate was mixed in the whipped cream. In the second filling I added some yolks as well. When cutting the sponge, one of the slices broke, so I made the first cake in five layers and used one of the layers to make some trifles. The second filling was made with two kinds of chocolates, dark chocolate with 74% cocoa and couverture chocolate. Since it was Easter, I decorated it with some chocolate Easter eggs as well. The Orthodox Easter was on the 1st May and as we were fasting on the 29th April and my daughter was to arrive late on the 30th April, we decided to wait to cut the cake on Easter day. As the pre-Easter period was also a very busy time, making Easter Greek cookies, Flaounes, Tsourekia, dying eggs and the preparation to make Mageiritsa, I made the sponge ahead and when it cooled I wrapped it in cling film and froze it. I also prepared the strawberry sauce ahead and also froze it as well. The cake has to thaw before cutting it. Since everything is made from scratch, you need about half an hour to make the sponge and about half an hour to bake it. It is preferable to make it at least the day before so that it may be cut easily. The strawberry sauce can be made while the cake is baking. You will need about half an hour to wash and hull the strawberries and fifteen minutes to cook them. Ten minutes to make the whipped cream, ten minutes to melt the chocolate and while it is cooling you can make the buttercream, another ten minutes. You will need about an hour for the cake to chill after assembling it and about an hour to decorate the cake, so you will need at least 3 to 4 hours in total. The first cake was made with the sponges layered without the help of a ring mold. For the second cake I used all six layers so as I do not have a small ring mold, I decided to improvise and make one myself. I cut a cardboard which I lined with cling film, which I fitted over the baking tin and then stapled it. Then I put it in the plate and started layering the sponge, chocolate mousse, strawberry sauce and repeated until I had all six layers. Don’t worry if one of your middle sponges breaks but use your best one for the top layer. The buttercream was made as usual and mixed with half of the whipped cream and enhanced with coffee flavour. In a few days it’s going to be Mother’s Day, so if you are thinking what to make for your Mother, this one is perfect and will surely please her, if she is a Chocolate and Coffee lover! I am giving away a free e-book with Greek desserts, so before leaving check the side bar where you will find it. All you need to do is to subscribe to get it! Whisk the eggs with sugar with K paddle on high speed for 5 minutes. Lower speed and add all the fluid ingredients: milk, olive oil, vinegar, liquid vanilla and Greek coffee (without the coffee residues at the bottom of your cup). Whisk for 5 more minutes on high speed. Lower mixer to low, add the dry ingredients: (flour, cocoa, baking powder, baking soda and salt) and mix until incorporated. Line two 18 cm / 7 inch baking tins with parchment paper and divide the batter. Bake in a fan forced oven to 170oC for 30 minutes or until a knife inserted in the centre comes out clean. Use 1 cup cooked, strained strawberries and use part of the syrup to wet the sponges. Prepare whipped cream and refrigerate (see instructions here ). Melt chocolate over a water bath. Remove from the heat but still over the water bath, mix in the coffee essence and yolks. The chocolate will start to thicken. Add a heaped tablespoon of whipped cream and mix until it softens. Add more if needed. Wait until it cools and mix more whipped cream, until you add half of the amount made and mix to combine. Sift the cocoa and icing sugar. Add the icing sugar and cocoa and mix with a spatula until it is almost incorporated. Add the remaining whipped cream and coffee essence and mix until creamy. Cut each sponge into three equal slices and wet them with strawberry syrup. Place each layer of sponge in the round ring and add 1/5 of the chocolate mousse and 1/5 of the strawberries. Continue with last layer of sponge and refrigerate for an hour. Remove the ring and cover the top and sides with buttercream. You can pipe some as decoration, if you like. Finally, decorate with strawberries and chocolate eggs or other type of chocolate. That looks stunning! Chocolate and berries are just fantastic together. Great post! Thanks for sharing this beautiful post about the Strawberry Chocolate Cake with 3 Greek Ingredients . This awesome article has inspired me a lot which you have shared in this post. Nice post!your Strawberry Chocolate Cake is looking delicious.I read your recipe and i try Strawberry Chocolate Cake at home its real very delicious and looking beautifully.